Like many of you, I love the look of a worn wood sign. My home and decor are not rustic, more modern to be exact, but a touch of rough wood here and there adds so much character. However, I cannot bring myself to find, deconstruct, and build a sign from an old pallet. So I made my own out of nice new clean lumber. 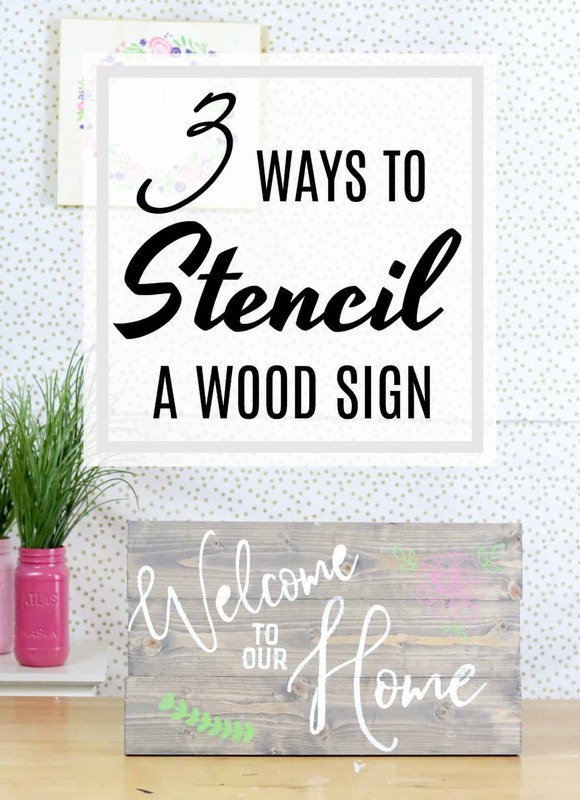 Get all the details on how to build stain and paint a wood sign below. 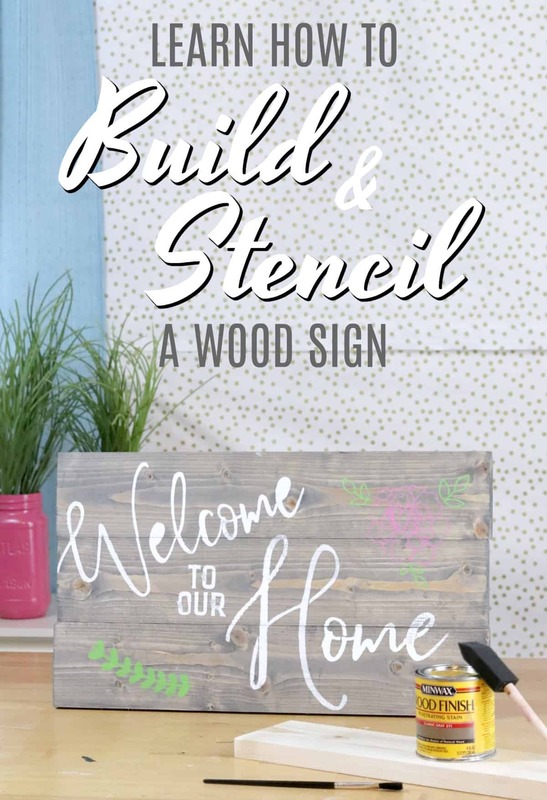 Learn how to build, stain and stencil a wood sign in this video series. Before I begin I should tell you what I have against pallet wood. It’s free and easy to come by, but it’s also dirty and could contain mold, termites or who knows what else. I am not comfortable bringing that type of wood into my home. So for around a few dollars I made my own wood sign, here’s how I did it. Gray stain and brush or cloth – this is my go to gray stain and it is beautiful. Get yours here! My sign measures 16×24, so I cut my 1×4 into 24-inch inch lengths using a miter saw. To attach them I cut the wood strip into 12-inch lengths to screw into the back. These strips can be found in the lumber aisle at a hardware store, they are rough and inexpensive. Watch how to build and stain a wood sign. I clamped the 4 pine boards together then placed the 2 wood strips on the back and drilled holes through the strips into each of the 4 boards. I placed screws in each board then removed the clamp. 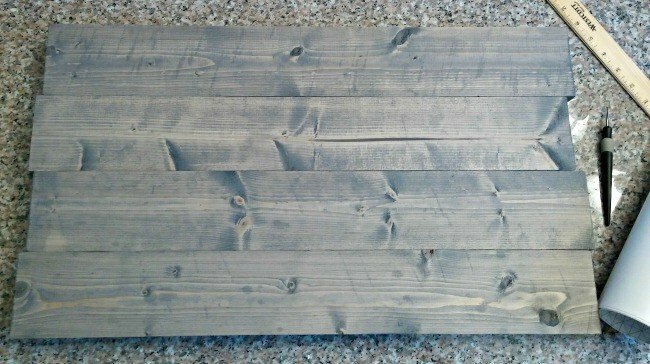 I love this gray stain , it is my go to for just about every sign I make. It’s light and you can use just about any color of paint over it. I used a sponge brush to apply a very light coat. I wanted to be able to see the wood grain and have a rustic uneven finish to my sign. Once I was done applying the stain, I took a paper towel and removed any excess stain from the sign. Once dry I was ready to stencil and paint a wood sign. I used my Silhouette to create a stencil that reads “Gather here with grateful hearts”. I widened my design space to 16×24 to lay everything out on the computer, then moved the words around to cut on a 12-inch wide piece of vinyl. I used oracle 631 vinyl to create this stencil because it is repositionable, you can also use contact paper. Be sure to watch the above video for 2 other methods of stenciling, including how to make a reusable stencil at home. I transferred the stencil to the sign, ensuring the stain was completely dry before doing so. Otherwise, the vinyl would not stick. I smoothed it down to remove any gaps then used a sponge brush to dab white paint onto the sign. I removed my stencil right away and allowed the paint to dry. Crisp clean lines every time when stenciling with a Silhouette and vinyl. If you love making wood signs, watch this video to learn how to turn this fun hobby into a small business. What a beautiful fall sign! I love the stain color you used. Thanks for the Silhouette inspiration! I love how your sign turned out! And I agree with you about pallet wood; I’d rather use fresh, clean wood from the hardware store – and my husband would rather me, too! 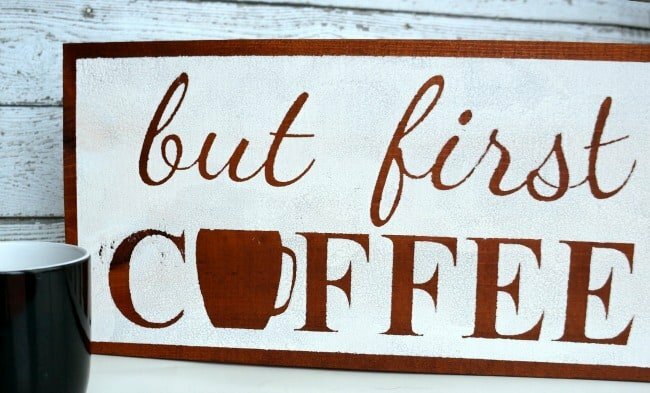 Love this wood sign! Especially you make it look so easy to make 😀 Thanks for the tutorial! Awesome sign! One of my favorite things to make with my Silhouette is signs. The possibilities are endless and it is soooo much fun! I love the look of yours with the farmhouse rustic-ness. Perfect for fall! I am looking into getting a silhouette machine and was wondering if you have any recommendations on a brand? Thank you in advance! Hi Lauren. The Silhouette is a name brand for an electronic cutting machine. There are others like the Cricut, but I have never used one so I can’t speak to how it works. I would visit the Silhouette website and check out the machines to see which one would work best for you. Can you tell me how you make the stencil? I tried cutting out a saying in vinyl but then I ended up with just the outline of the letter (for instance an e) and not the middle of the letter so you couldn’t tell what the letter was – what am I doing wrong? You need to reverse weed. Just remove the part you want to paint. 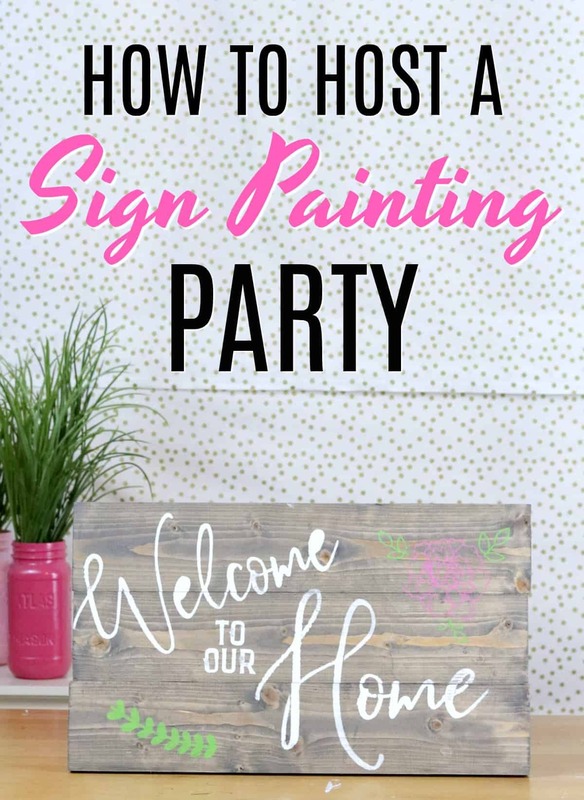 So you would take out the letters and other design you would want to paint on your sign. So glad you liked it, thanks for including me in your post. Love this sign! I just received my Silhouette Cameo (using my gift card – THANK YOU!) and am getting busy on my long list of projects! I am getting ready to try the stencil technique and your ideas & tips are very helpful. How do you make a large stencil? Do you have to remove and reposition the vinyl? When I make a stencil for a large sign like this, I make it in pieces. Sometimes just one word at a time. I typically can apply all the pieces of the stencil vinyl to the wood at one time, but sometimes I have to do it word by word. Hope that helps, thanks for reading. I love this sign! Thanks for the tips! What a pretty sign! I’ve been wanting to make a sign, but wasn’t sure what type of wood to use. Is the pine board inexpensive? I know you said the sign cost $2. Did you already have this wood on hand? I’d like to find a light weight wood, but I’m not too familiar with it all! Thanks Andrea, yes pine board is very inexpensive. 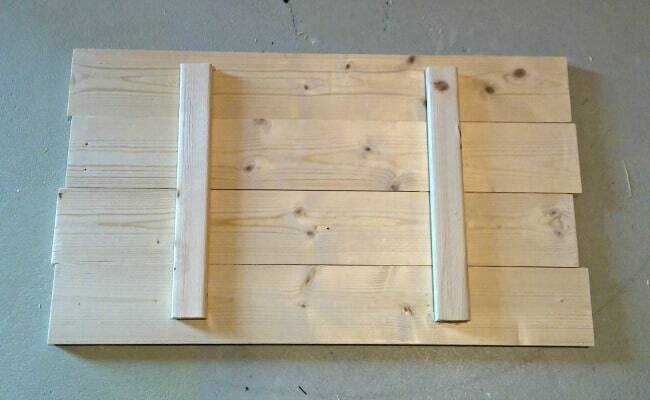 You can pick up a plank at a hardware store for around $2. I hope you’ll give this a try, have fun! On the duralar do you use the .003 or .005?? Can the stencis be used more than once? Yes they can, just be sure to clean them with soap and water and let them dry. What do you use to hang the sign on the wall? Do picture frame hooks, like a sawtooth, hold this sign up? I use wire and d-rings to hang mine. I think these signs are too heavy for a typical saw tooth hanger. You can get a small spool of wire and few hooks for just a couple dollars, they are typically sold as a set. I have 2 ring hooks near the top 2 corners then I strung the wire between them and hang my signs from a screw anchored in my wall. Thanks for reading! Thank you! 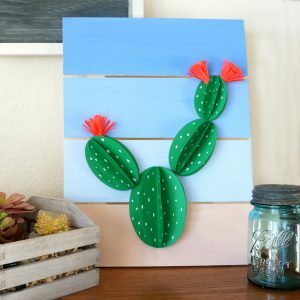 Looking forward to making my first one this weekend! I have searched for so long a step by step to making signs. I finally found yours and found it to be very easy to follow. I am more confident now in starting my first sign. Thanks for sharing all your great tips. I am so glad you found this helpful. Enjoy your sign making and thanks for reading. Great tutorial. Did you have rounded edges on your 1×4 board? I do and where the boards connect there is a groove and I think the paint may bleed down those grooves. I have already had one project bleed and trying to avoid another fail. The wood I use for these signs does not have rounded edges. That may cause your paint to bleed, I would do a test spot first, maybe on the back of the sign to see how it works. After the painted letters dry, is there any sealant or final step you perform to make sure it’s protected from scratches, etc.? Hi Michelle, thanks for reading. I personally do not seal my signs, I keep most of them indoors and they have held up really well. If you want to use a sign outdoors or are worried about scratches I would use an acrylic clear sealer. It can be found at a hardware store in the paint section in either a spray or a can that you can brush on. That’s wonderful, so glad I could be of help! Have fun with you signs. What fonts did you use for this? Hi Coni. The closest font I can find to this is Brush script. I no longer have the original font I used for this sign and don’t remember the name of it. Thanks for reading, I hope this helps a bit. Looks great! What type of adhesive did you use for the stencil? Thank you! I use basting spray, it’s intended for quilting and has a temporary hold. You can find it at a fabric store, or even the fabric section of a store like Walmart. Works great for stencils. what did you use to “seal” it when you were finished? I do not typically seal my signs unless they are going to be outside. The paint and stain hold up beautifully without a sealer. Hi how do you make the letters look good and not messey in the crack of the wood where the piceces of wood come together? It’s all about a good stencil. There is a video in this post that walks you through what I use. I like reusable stencils with a temporary adhesive. Or you can use vinyl as a stencil. No matter what you use be sure you are not using too much paint. Wipe off your brush and use a very small amount. You can always go back and add a second coat of paint. Wow, its beautiful / great job. I would NEVER use pallet wood because of the “chemicals” the wood is treated with. So much of it is imported from other countries and has to be sprayed with a spray to kill any living thing so not to transport any bugs into our country. I cringe when I see people with coffee tables or beds made for there kids…the wood might be “free” as in not having to pay for it. But definitely have concern about the contents in the wood. Wonderful video, thank you! You had mentioned making a stencil cutting video. I looked for one but didn’t see one. Did I miss it? What is the color you used for the letters? Hi, what kind of paint did you use? I’m wondering if acrylic paint will adhere to an oil based stain. I used acrylic paint, the kind you can get at a craft store. Be sure to let the stain dry completely before painting and it will adhere just fine. What kind of paint do you use to paint your design over the min wax stain? I use acrylic craft paint most of the time, I have also used chalk paint. As long as the stain is completely dry craft paint will work really well. Is one of the 3 methods better than others for stencilling on a curved surface? My boyfriend has a piece of stockade fence that we never used for the backyard, and each picket(?) has a slight curve to it. We gave up the idea of using a pre-cut stencil from the craft store, since they’re too firm and inflexible — besides, our son has his “new toy” Cricut, that he uses to make car decals and iron-on T-shirt designs. So now I’ve been charged with coming up with a design. I believe that with his machine, and your suggestions above, we can make a beautiful, personally meaningful first wood sign. This sounds like a fun project. You can design and cut just about anything with a Cricut. I would start with vinyl for this stencil, you should be able to cut and place a design on a slightly curved surface. 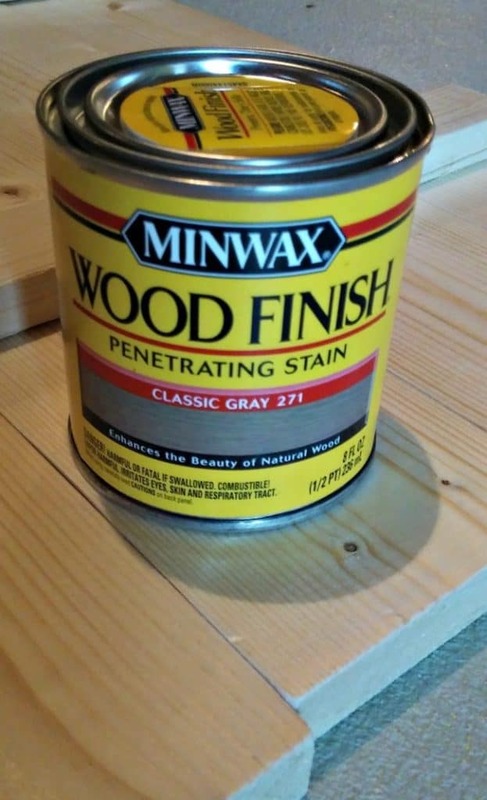 Just be sure to really press the vinyl into the wood so you get a good seal before painting. Good luck and have fun! Thank-you for the great video about signs! It has been very helpful to help me as I make my first sign. I made a stencil using the Dura-Lar film; however, can’t get it to stick using the temporary adhesive I have. I have the 202 temporary adhesive. Do you have any advice for how to get it to stick? I am trying to paint the stencil on a stained wood board. Thanks for your video and your help! I use a similar adhesive, I typically spray it on the back of the stencil and let it become tacky for about 30 seconds. Then press it onto the wood. I would make sure the stain is completely dry first, that helps the stencil stick as well. Hope this helps. Good luck with your sign. I really enjoyed your every detail on how to stencil and what works and where to buy. Did you use water or oil based stain? I have used both, I actually prefer oil based but either will work. The key is letting the stain dry fulling before moving on to your stencil. Thank you for a very clear and inspiring project. 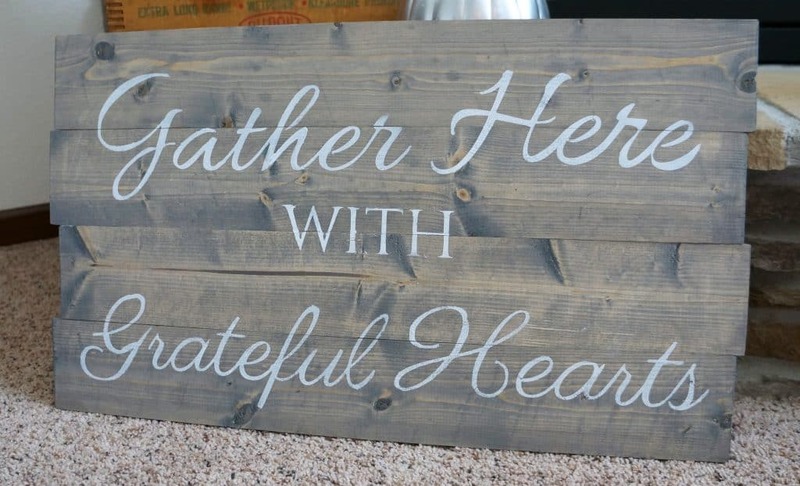 I just love the use of wood and beautiful lettering which you make look like a breeze to do.